Papal visit: Have immigrants saved the Catholic Church? An influx of immigrants have brought their faith into the pews of Catholic churches in the UK since Pope John Paul II's visit in 1982. Just how important are these newcomers to the Church's survival, as Pope Benedict XVI prepares to begin his tour? "There used to be less than 10 black people in the congregation, we used to sit together at the left side of the church," says Patrick Chatukuta. "Now, in the last three years, it's all us." This 48-year-old Zimbabwean, now living in Plumstead, has been attending St Peter The Apostle church in Woolwich, south-east London, since 2003. He says an influx of immigrants, many from Africa, has changed the demographic of his church's congregation. Its priest, Father Michael Scanlon, says the local immigrant population has swollen his flock each Sunday to 1,000 - including 200 teenagers. They come from 45 nations . "There's a new springtime coming to the Catholic Church, especially in London," he says. "Some churches in parts of the country are going through a tough time, but the sons and daughters of other countries are helping to build an even better and stronger church here." While his church is clearly thriving, the debate over the state of the Church's congregations remains a contentious one. Keith Porteous Wood, of the National Secular Society, says mass attendance in Great Britain has "dropped by half in 20 years", from 1,913,200 in 1990 to 972,800 in 2010. He also says that "the evidence shows Catholics are abandoning their faith at a breathtaking rate", regardless of any increase of foreign nationals to the Church's pews, and that there will be only 101,700 Catholics attending church annually by 2050. 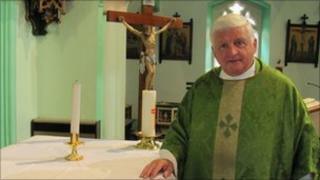 "The projection is that Catholicism will become almost a cult in this country," Mr Porteous Wood said. "The Catholic Church will be unsustainable as a national institution within just a few decades." The Catholic Bishops Conference of England and Wales accepted about million Catholics were churchgoers - but pointed out it represented a high proportion of the estimated four million Catholics in the UK. One of Father Michael's flock is Cynthia Nwakibu, a 52-year old physiotherapist from Woolwich, who hails from Nigeria. She says the manner in which he handles his services "reminds me of how seriously and deeply we take our services in Africa". The Archbishop of Westminster, Vincent Nichols, says the profile of an average Catholic parish in most cities in the United Kingdom "is now of a multi-ethnic, multilingual, multicultural community. "My impression is that most Catholics here recognise in a person who's come from the Philippines, from Poland, from wherever, they recognise a fellow Catholic, and that is the basis on which people are welcomed and seen for the most part as enriching their parish." Anna Arco, from the Catholic Herald, says the history of the Catholic Church in the UK shows it "has always been a migrant church". But although she estimates that Catholic congregation numbers are only a "bit smaller" than in 1982, the year of the last papal visit, she says overall attendance is declining. "Rural areas are struggling a bit more than urban ones. Sometimes it seems as though numbers aren't going down, but that's because parishes are being put together, and that's because of manpower and demographics." Ms Arco says the church is trying to focus on young people with evangelical projects. She added: "So the Church always has to be hopeful about the future. They will just have to be quite creative about how to best serve their communities." Immigration does not just benefit urban areas - in the Highlands a rural parish church was recently boosted by an influx of Lithuanians, and a Derbyshire parish has had an influx of nurses from the Philippines to swell its numbers. But only some parishes have employment opportunities to attract immigrant workers, who would bring their faith along. Many seem to welcome their church becoming a melting pot of nationalities - the Woolwich congregation all celebrate each other's saints' days and sing hymns in different languages. But in some areas there are segregation fears. In Scotland, there have been concerns that some priests, over from Eastern Europe, are trying to keep fellow nationals separate from the local community, particularly in faith matters. Paul Woolley, director of public theology think tank Theos, says that while Catholic congregation figures declined up until 2005, they have stabilised since then. "Immigration has certainly benefited the Catholic Church, because when people come over from other countries, particularly Eastern Europe, they do not leave their faith behind. "The youth movement in the Catholic Church is particularly strong, especially among those in their teens and 20s. They may have problems in getting young people to become priests, but not with them going to church." In Woolwich, Father Michael explains how the congregation at his first sermon held here in 1994 looked very different to how it does now. "When I arrived our congregation was very white, Irish or of Irish descent, and numbered about 400," he says. "Never too many young people, hardly anyone from Africa or elsewhere. Now there's new blood coming into the Church, and it's alive and well." The Pope's British Divisions was broadcast on BBC Radio 4 on Thursday, 9 September. Click here to listen again.